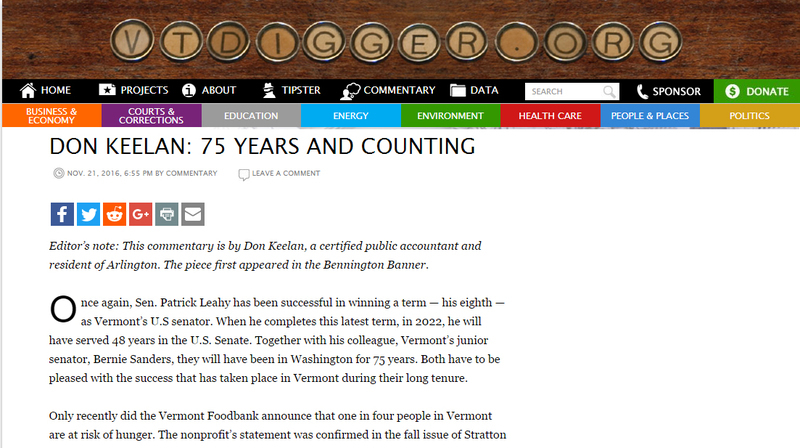 Once again, Sen. Patrick Leahy has been successful in winning a term — his eighth — as Vermont’s U.S senator. When he completes this latest term, in 2022, he will have served 48 years in the U.S. Senate. Together with his colleague, Vermont’s junior senator, Bernie Sanders, they will have been in Washington for 75 years. Both have to be pleased with the success that has taken place in Vermont during their long tenure. Only recently did the Vermont Foodbank announce that one in four people in Vermont are at risk of hunger. The nonprofit’s statement was confirmed in the fall issue of Stratton Magazine which noted, “Consider: More than one-third of families in the state depend on food banks and school lunches as their main resource for meals for their children.” The senators’ goal is to see that 100 percent of Vermont schoolchildren will one day be receiving their breakfast and lunch, thanks to the Healthy Hunger Free Kids Act of 2010.